The collective Mare Liberum suspends a flotilla of their artist-built boats that have been used in over a hundred different performances, actions, citizen science field trips and participatory voyages over the past ten years. Zuccotti Park on June 29. As part of Mosher’s ongoing investigation with Liquid City, Desire invites gallery visitors to wander and explore the rich history of Lower Manhattan’s waterscape through a participatory map. Visitors were invited to take a bottle and map and enjoy the journey, creating city-scaled maps of their own. Manhattan, embodying and inventing the new water reality and imaging a future existence on June 16, 17, and 18. FSDE shares a sculptural installation that invites participants to investigate their material surrounds from atop a post-natural lifeguard chair. This new work is based on their four-part project they launched in June 2017: A Field Guide to the Dark Ecologies of Newtown Creek. FSDE led a site-specific experience on Newtown Creek on June 13 and 17. Installation of fishnet, chairs, tables, mason jars, conch shell, archival newsprint, signage with instructions for audience. McGregor invites the audience to interact with and experience the residue of the fishtrap world as part of her iterative performance project rooted in the vanishing fishing tradition of the artist’s 91-year-old father. 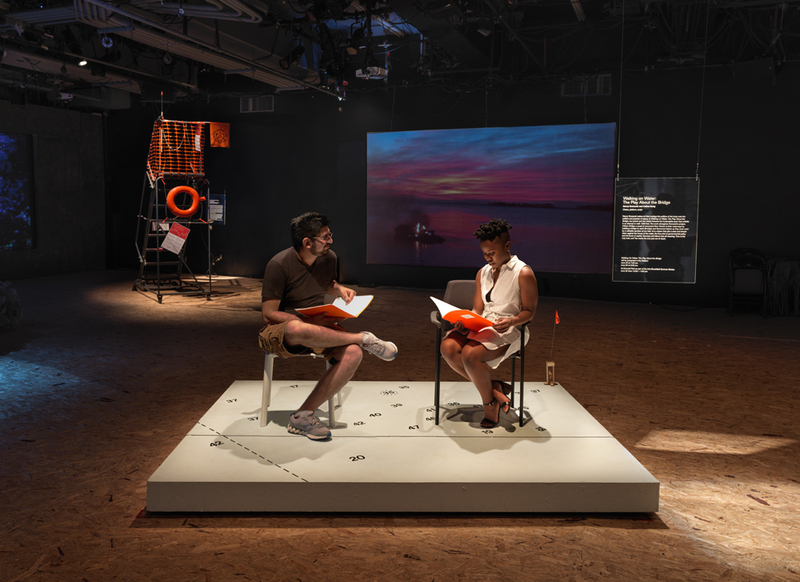 A performance at New York Live Arts was livestreamed into 3LD on June 17. Nowacek worked with theater artist Celine Song to re-imagine her ongoing project, Citizen Bridge as a performance. The Play About the Bridge was presented in the gallery on June 20, 25 and in Zuccotti Park on June 22. Dyson journeys clandestinely underwater to sites such as the Gulf of Mexico and Cape Town, South Africa exploring indelible ties between geography, economy, color, time, sensoria, and what it means to be a human body of these ecologies. Mattingly premiered Mittere at Works on Water. Making this work was a personal form of letting go and a symbolic form of regeneration, as a response to her WetLand project and Waterpod—both alternative living experiences. Concurrently, Mattingly’s public floating food forest SWALE in Brooklyn Bridge Park, Pier 6: was open and free to the public. Lorenz takes New Yorkers on 24 hour taxi trips in a boat she built on three dates in June. Livestreaming ran during Gallery Hours on: June 5, 18 and 25.